Even as the deadliest floods in living memory rage across Pakistan – affecting more people than the 2005 Kashmir earthquake, the 2006 Asian tsunami, and the 2010 Haiti earthquake combined – tensions between India and Pakistan can still obstruct efforts to help those in need. With over 20 million people affected – more than the population of Australia or several European nations – and about a quarter of Pakistan under water, some people still find time to play politics. When India generously offered $5 million to Pakistan, cyberspace and media pundits exploded with negative comments. From Pakistan came comments like: “Too little too late” and “Pakistan should not accept because of the bloodbath in Kashmir”. From India came: “The PM should withdraw the offer if Pakistan doesn’t immediately accept it”, and “India should not offer aid to Pakistan because they sponsor terrorism”. It is to the credit of both governments that they did not succumb to this pressure. Meanwhile, Indians at home and abroad, as well as others, are increasingly stepping up on a private level to help out with flood relief efforts in Pakistan. VillagePastels‘ fundraiser, California: Writer Yasmeen Fatimah originally from India, has organised a fundraising event under the banner of VillagePastels on Sunday, August 29, 2-7 pm at The First Presbyterian Church (1140 Cowper Street, Palo Alto, CA) — the church has offered the space for free. The event is being co-sponsored by several organisations, including Multifaith Voices for Peace and Justice, The Citizens Foundation-USA, Our Developing World, American Muslim Voice, PakUSOnline, and SARelief. The involvement of non-South Asian organisations, says Yasmeen, “reflects a global, multi-faith community showing solidarity and support for the people of Pakistan facing a calamity of unimaginable proportion. Joint India-Pakistan Forum for Relief — Aman ke Badhte Qadam update (see also ‘A peace march… and joint flood relief efforts): Civil society organisations and concerned citizens of India and Pakistan who met at the culmination of a peace march in Amritsar and in Lahore on Aug 14-15 have launched a Joint India-Pakistan Forum for Relief to help the affected people of Pakistan and Leh, India. All funds collected will be spent for the victims of the disasters in Pakistan and Leh. “We will transfer the money, medicines to the affected people with the help of High Commission for Pakistan, New Delhi and Red Cross and to credible voluntary organisations with impeccable track record in Leh,” writes Mazher Hussain of the Confederation of Voluntary Organisations (COVA) in Hyderabad, Deccan, one of the leaders of the peace march. Contact Details: COVA, 20-4-10, Charminar, Hyderabad- A.P. India- 500002. Ph: +91- 40- 24572984, Fax: 24574527, Email covanetwork@gmail.com. Indian artists donate their works: Many Indian artists, including some big names, have jumped at the idea of donating their works to be raffled off against a ticket worth a certain amount (to be determined). “We hope to raise 20 lakhs to be divided between Leh and Pakistan, thus making it a joint project of an artists’ initiative working for both India and Pakistan,” says Shireen Gandhy in Mumbai, whose brainchild this is. She expects to complete the collection by the middle or end of September. Joint fundraising in the EU: Indian radio journalist Ujjwal Bhattacharya (who unhesitatingly sent a personal donation across for flood relief in Pakistan) in Germany and Pakistani television journalist Khalid Hameed Farooqi (Geo TV correspondent) in Brussels are working on a joint fundraiser for flood relief in Pakistan. These are just a few of the initiatives taking place around the world that involve non-Pakistanis, particularly Indians, who are saddened by the tragedy that has hit Pakistan, and who have the heart to rise above politics to help out in whatever way they can. Watch this space. Sufi Moon contribution: Dr. Anna Grichting-Solder, a Swiss architect, urbanist and musician who runs the non-profit Bordermeetings, is donating all proceeds of Sufi Moon to flood relief in Pakistan. The Sufi Moon project combines Swiss Pakistani musical project interweaving alphorns with Qawwali music. From 2000 to 2002, the group performed in Switzerland and Pakistan with. More information at the website. Anna, whom I first met at the Sufi Soul World Music Festival in Lahore in 2000, writes, “My thoughts and prayers go to all the victims of the floods in Pakistan and to all our friends there…. If you would like to buy the CD Sufi Moon or any one of the tunes, I will donate any proceeds to the victims of the floods in Pakistan. Please go to the following website where you can order the CD or download the tunes. Indus Flood Relief fund collection drive To overcome the difficulties of Indians wanting to sending money across from India for flood relief in Pakistan, editor Kanak Dixit and colleagues at Himal Southasian, a monthly magazine in Nepal, set up the Indus Flood Relief fund collection drive in partnership with Standard Chartered Bank Nepal in Kathmandu. “Please avail this facility to send money to the victims of flood along the Indus. No administrative charges will be applied; every paisa will be transferred to trusted organisations in Pakistan for the benefit of the flood victims,” writes Urooj Zia, a former News staffer now working at Himal. 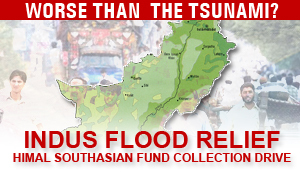 Please refer to the Indus Flood Relief page at Himal’s website for details. It is amazing to see the efforts our neighbors are putting in to help us. It’s times like these when every single effort counts. We as a nation should be grateful and see this as an opportunity to shake the hand India has extended to us, rather than being egoistic.